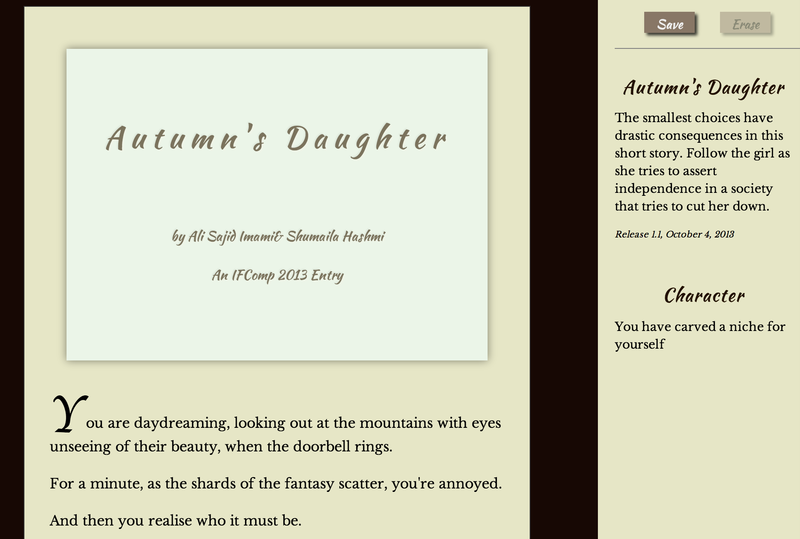 Autumn’s Daughter is a choice-based Undum work about arranged marriage in Pakistan. It’s quite short, running perhaps five minutes to play through once and a little longer to explore fully. The premise of Autumn’s Daughter is that the player controls a young Pakistani woman threatened with an undesirable arranged marriage to an abusive man many years older than herself. There are hints of other ways her life might go: her friend has an attractive brother who might be an alternative groom, and there is also the possibility of going to teacher training school and gaining a career instead. But many of the possible outcomes are extremely unpleasant. The setting and premise of Autumn’s Daughter appeal to me a great deal. Not, I mean, that I am enthusiastic about women being treated this way. But I am interested in stories that explore settings I haven’t seen dozens of times before, that deal with real world problems, that teach me about something I might not otherwise have known. To that end, I wished the story had been substantially longer. That would have allowed me to spend more time with the character, learning about her life, coming to sympathize with her. I would have been curious to play through more scenes of her daily life and her interactions with other members of the household. What does a Pakistani wedding look like? What would have happened if the protagonist tried to speak directly to her father about her situation? Could we have seen more about what motivates her parents, as well as what motivates her? I don’t want to excuse them for what they’re doing to her, but I suspect there are social pressures on them as well, and I would have liked to explore more of the system that produces these results, rather than simply casting her father and her husband-elect as pure villains. More thoughts when I can talk about the endings. My favorite endings here were the ones in which the protagonist either (a) marries the horrible older man but plans a long-game resistance, building up her library in silence and preparing to train her son to be a better man; or (b) runs away with the assistance of an organization designed to rescue women in her situation, and begins to pursue a different life. Running away with Hashim seemed like it was only semi-winning: I’m still at the mercy of a man, and while that man is more attractive and more sympathetic, it seems like it might not be a fantastic outcome. Also — I’m not sure whether this was intended or not — because two of the three options for talking to Hashim end with him more or less abandoning me, my overall sense of his character after playing multiple playthroughs was that he’s actually not that nice a guy. This might not be how the story is meant to be read: for instance, the character of Laila, whom we meet at Samira’s house, can turn out either to be the heroic operator of a sort of women’s rescue organization, or the predatory operator of a brothel, and these two incompatible outcomes depend on how we choose to regard her. So there’s not a consistent underlying truth about Laila in the story. I get it, I think — the idea is that when someone comes offering you a way out in this situation, you can’t be sure whether they’re reliable or just looking for a way to use you, too. But by making the underlying “truth” of the story variable, Autumn’s Daughter hovers in a curious way between the general and the specific. Is this a specific story about particular characters, or is it a general simulation of a general problem? Some of the characters appear to be consistent across playthroughs, but not all. Because some of the situations were so extreme, I also found myself wishing that the story provided more context for some of the options. When the gunmen show up to kill you and Hashim as punishment for running, I assume that this is an honor killing, and a bit of internet research seems to confirm my suspicion, but the game itself doesn’t offer very much information. At another point, we’re told that running away with Hashim could bring bad consequences to the family members left behind — but what consequences would those be? Again, I can make some vague guesses, but I would have liked to learn in more detail. There are several ways the game could have gone by way of providing this context. It could, again, just have been longer, with more detail and explanation. In a few places, the story does gloss an interaction with extra information — for instance, to explain the garment the protagonist is wearing, or to let us in on what it means that she addresses Hashim by his name. These are cultural clues I would have missed without the gloss, and I would have liked more of this. Alternatively, it could have relied on external sources for some of the events. This would have broken the fiction a little bit, perhaps, but I found myself thinking about Merritt Kopas’s work, especially Positive Space (NSFW) and Conversations with My Mother, which use links out to factual resources to add context. I could imagine a version of Autumn’s Daughter that linked to news stories or provided marginalia to the main text. I originally had this review scheduled for a couple of days later, but I moved it up so it could run alongside Impostor Syndrome. Without going into too much spoilery detail, I think the two pieces are worth comparing — in their aims, in their structure, and in the way they both operate through the perspective of a semi-characterized, semi-every-person victim. This entry was posted in Competitions, CYOA, interactive nonfiction, interactive romance, Reviews by Emily Short. Bookmark the permalink. Is this a specific story about particular characters, or is it a general simulation of a general problem? Some of the characters appear to be consistent across playthroughs, but not all. Hm. I think I’m a lot more comfortable than a lot of readers with CYOA that presents alternate worlds depending on your choices. (In The Campfire Crush, there’s a love interest who, depending on what course you take, turns out to be a total jerk; to be going out with another, higher-status girl; or single and pleasant. In Pretty Little Mistakes the afterlife turns out to be radically different in unpredictable ways.) I think this makes all kinds of sense in games that are heavily concerned with how the protagonist makes choices, and I really don’t think that it’s automatically opposed to stories about particular rather than general characters. I suppose there are two models for CYOA design: accretive, where the world is basically consistent and replaying helps you understand the same thing from different angles, and subjective, where the sum of branches below a particular decision says something about the nature of that decision. The many afterlifes in Mistakes aren’t, I think, a solipsist argument that the protagonist’s life literally changes theology and metaphysics; it’s a statement that the protagonist can’t know anything about afterlife, so from her decision-making POV it could be anything. The two techniques often interfere with one another, though, and the subjective one works much better when it’s clear that that’s what’s going on. Autumn’s Daughter isn’t always entirely clear about this, and its choice of using Areesha’s tone as the determining factor is pretty sub-optimal. I had a brief discussion on the matter here: http://www.intfiction.org/forum/viewtopic.php?f=32&t=9549&start=10. I think you people are right in stating that knowing something about the other actors would have been awesome. My fear stays, and it’s about the fact that giving too many insights on the nature of the father (i.e.) would mean ending in thinking it’s not his fault, after all. As stated in that conversation, I believe that this IS the case, after all (it’s much more a society’s illness than a personal flaw being a dork, in most of the cases). But, then again, I believe the authors wanted just to tell everybody what is happening there. As I believe many won’t even think similar facts are facts at all, I do prefer to point a finger instead of mixing things too much up. In the occidental world, such things would be so horrific (the larger part of it, at least), that dwelling between the lines would be mandatory. In the specific case, i think that a first step must have been taken, and the first step must necessarily be easy and recognizable. Sam, you made me think about that “self fulfilling prophecies”. There is a lot to be said about. I just want to address two things. 1) Yes, we are too much bound by the rules of re-playability to acquire as correct a character that changes so abruptly between two straightforward choices. One should consider each playthrough per se, with no connection to the eventual other. Better still: we should play just ONE road and see where it takes. As in real life, one should not be granted the possibility to live the same day twice. 2) In the end, who knows if it’s real or unreal, such a situation? Has anybody ever been able to live the same day twice? Who can grant me that changing a belief about a person/situation/event wouldn’t dramatically change that same person/situation/event? How can we be sure that reality is not, as a whole, made up by our own minds? But this, I believe, is pure philosophy. And I don’t want nothing from the realm of the imaginary.